Thimphu is a small, charming capital city, probably the smallest capital in the world, resting in the heart of the Himalayas. It sits in its own valley fanning out from the river. 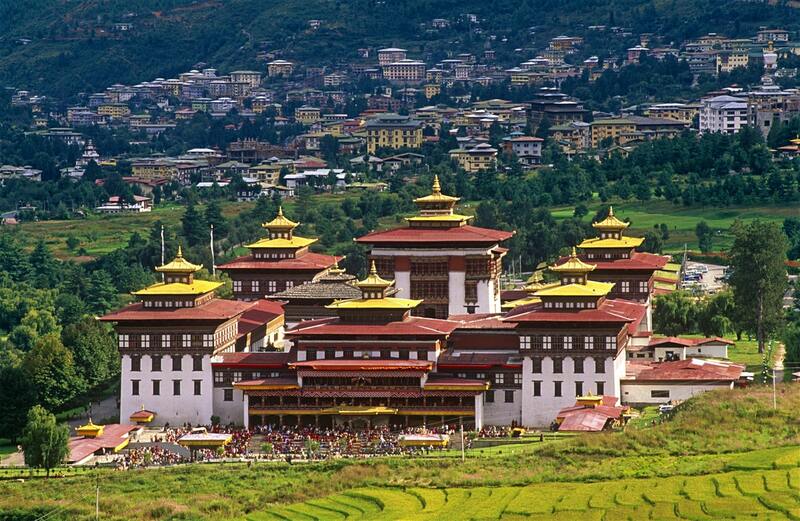 The skyline hardly changes as new buildings are all constructed in traditional Bhutanese style. Though a small town, Thimphu is a charming place. Every shop is stacked with multiple products – from grocery to textiles to shoes and handicraft products. Increasing number of shops sell imported goods brought in from Thailand, Hong Kong and Singapore because of Druk Air’s connection to Bangkok. The town is also filled with bars selling all kinds of alcoholic drinks. The capital is located at 7,500 ft overlooking the Wang Chu river valley. It is surrounded by forested hills on all sides. Worth visiting are the Memorial Chorten, Tashichoedzong, Central Tower, the mini Zoo, painting school, National Library, hand made paper factory and the handicrafts emporium. Paro is one of the most beautiful valleys of Bhutan. The fresh air, pine covered mountains around the valley and cluster of villages scattered over the valley is a treat to nature lovers. A walk in the village or a short trek in the jungles will be a pleasant change from the hectic life for visitors from the metropolitan cities. A trip to Chilela, the mountain that divides two valleys of western Bhutan, Ha and Paro, will treat you to the cool fresh air and the beautiful ranges of the Himalayas. A visit to the imposing Paro Dzong, the National Museum (Ta Dzong), the ruins of Drugyel Dzong and the small town are well worth it. One may also spend sometime on the river bank. The Taktsang Monastery, one of the holiest in Bhutan is perched high up on a cliff in the valley and can be seen en route to Drugyel Dzong. En route to Punakha is Do Chula Pass at 10,000 ft. Here the view of the Himalayan panoply is one of the most spectacular in all of Bhutan. Punakha and the central valleys tend to always be a few degrees warmer than their surrounding areas. Punakha at 5,000ft is North of Thimphu and enjoys a milder climate. It is a lovely valley with great scenic views. It houses the magnificent Punakha Dzong on the confluence of the Mo Chu and Po Chu rivers. This wind swept town is an hour’s drive from Punakha along the Punak Chu river and en route to Trongsa. Wangdiphodrang Dzong is located on the confluence of Punak Chu and Dang Chu rivers. The small village of Gangtey is at the edge of the Black Mountain range and is awash in golden hues – from its yellow roofed temple to the wheat fields where the black necked crane come from Tibet. The drive from Wangdi to Trongsa (129 kms) in Central Bhutan is through wilderness country and very scenic. En route is the Chendebji Chorten next to a river. The Trongsa Dzong is perhaps the most majestic fort in Bhutan overlooking a deep gorge. Only 2 hrs drive (68 kms) from Trongsa, two passes and a series of hair-raising bends lead one to Bumthang – the cultural and geographical heartland of Bhutan. The valley around Jakar (8,400 ft) is one of the most spectacular in Bhutan. A walk in the valley is highly recommended. Some of the places to see are Kurjey Lhakhang, Jambey Lhakhang, Karsumpey Plateau & the Swiss farm as well as Jakar Dzong. The broad valley with the Bumthang Chu flowing through it and the monasteries scattered along the valley with forested slopes all around give it a heavenly look. Mongar in East Bhutan is built on both sides of the hill. The drive from Ura in Bumthang takes you up Bhutan’s highest pass (12,400ft) at Thrumsingla and is one of the most beautiful Himalayan journeys. Trashigang is the Easternmost point on the highway and a melting point of the hill tribe people who come into the town to trade. The Dzong built in 1659 sits on a jagged piece of land and commands a spectacular view over the valley. This town marks the exit point from Bhutan on its Eastern border. It is 110 kms from Guwahati.